The tragic killing of Trevon Martin in Sanford, Fla., has provoked national outrage and is also the subject of a Justice Department probe. This is a far different response from the virulent racist America of a century ago, when white America and Washington were indifferent to such slayings. The outrage sweeping the country today over the young man’s slaying suggests something very important has changed for the better. And it should be a call to action. Back in the 1920s, when the Ku Klux Klan was at the pinnacle of its sadistic influence, as many as 1,000 lynchings of black men took place in a typical year and any national outcries against them were muted. Klansmen could murder in cold blood and go to work the next morning as if nothing had happened. White Americans, generally, did not get upset over lynchings. Ku Klux Klan members often held posts of influence in their communities, particularly in the South. The murdered blacks had few, if any, allies in the white communities. Presidents such as Woodrow Wilson were themselves racist. Not far from where Trevon Martin was shot down, on Christmas Eve, 1951, the NAACP’s Rev. Harry T. Moore and his wife were murdered by KKK dynamiters with a bomb planted under their bedroom. I remember walking in a small, largely African-American protest march in Rev. Moore’s memory the following New Year’s Day through the streets of downtown Miami. Perhaps there were some sympathetic white onlookers but I do not recall any. Only four years later, though, the murder of 14-year-old Chicagoan Emmett Till in Money, Miss., for allegedly whistling at a white woman, created huge street demonstrations on Chicago’s South Side. Listening to the orators addressing the crowds, I had the welcome feeling the Black community, at the least, was not going to stand for it any more. Too many Black veterans were asking, “What did we fight for to be treated this way?” The outrage was fierce as Till’s killers were acquitted of his torture and murder. Till’s Mother insisted on an open casket funeral so the public could witness how the killers had brutalized her son. Protected by laws against double jeopardy, after their acquittal, the killers casually admitted their guilt and walked free. It has been said that Till’s murder was the spark that ignited the civil rights movement. In that struggle, still unfinished, the introduction of the non-violent response by Rev. 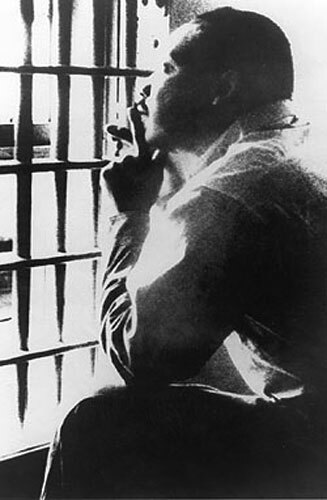 Martin Luther King created vast sympathy for oppressed Black citizens. The Montgomery bus boycott impressed the nation with their courage and determination and their struggle for equal rights and opportunities. By 1963, the climate had so changed that King’s “I Have a Dream” speech at the Lincoln Memorial generated an overwhelming positive national response. Following this remarkable address, the civil rights cause accelerated rapidly. The continued sacrifices of both Blacks and whites alike had put a large segment of America’s white population on the side of social justice. In June, 1966, when James Meredith was shot down in Mississippi, the shooter was apprehended within minutes by the local sheriff and put on trial and convicted---an outcome that would have been unthinkable a decade earlier. The day after the shooting, in my capacity as Meredith’s press coordinator, I told an NBC “Today Show” audience that his several companions planned to finish his March Against Fear, and invited people of good will to join us. Thousands from all races responded over the next few weeks so that the renewed march became, literally, a turning point and victory celebration over Jim Crow in Mississippi. Voting rolls were opened to Blacks and we received the support of many white Mississippi residents who had been waiting for an opportunity to step forward and speak up for racial equality but had been afraid to do so. In spite of all the civil rights movement has achieved, a descriptive term that can still be applied to Black communities today, unfortunately, remains “plight.” The statistics on Black-white disparities in income, housing, justice, and education remain profound. Administration after administration, including the present one, has failed to make amends for what is now four centuries of historic racism. President Obama has shown more interest in pursuing the foreign wars of his predecessor than in spending the trillions of dollars wasted on those wars to promote the general welfare of Americans. This includes the need to level the playing field for African-Americans, by supporting decent housing, crime reduction and penal reform, full employment, job training, quality education, leveling the playing field for unions, and more job opportunities created by employers, state governments and Washington. The battle is ongoing. One affirmative step would be to teach basic non-violence to every child in every school in America. Another would be entrepreneurial teaching (self-reliance and business acumen) starting in grade school. Trevon Martin’s death should serve to remind us of the long road that has already been traveled just as it informs us of how far we as a nation have to go. It should be a call to action for social justice for the African-American community.